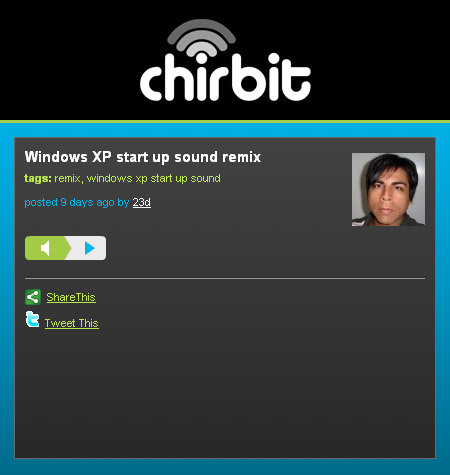 Chirbit is an easy and fun way to share audio on any social network, but for this post I am going to focus specifically on Twitter. Follow these easy steps and you will be sharing audio on Twitter like a pro! Sign up for a Chirbit account. All you need is a username, a valid email address and your password. 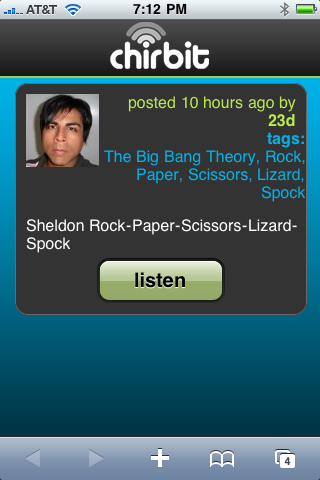 You can sign up to chirbit here. Post your audio. This can be accomplished in a number of different ways with Chirbit. 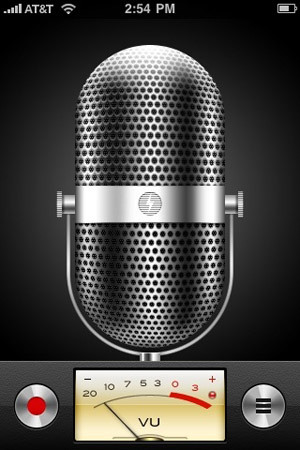 You can record your message straight from the browser using the Chirbit recorder, and your microphone or webcam. 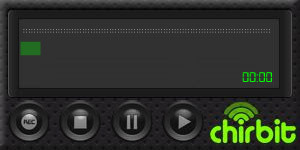 You can upload an mp3, wav or m4a file using the upload form. Click on the Option button on your Chirbit post. Click the Tweet This Chirbit button. The "Tweet This" button will post your short URL and the Title you gave your Chirbit on your Twitter account. Currently you must be logged in to Twitter and you must click the update button manually for this to function. In the near future you will be able to choose to do this automatically for all of your posts via the settings area. Check out how others are using Chirbit with Twitter by searching twitter with the term "chirb.it"
Your favorite Movie Quote The Snozzberries taste like Snozzberries! Pronunciations How do you pronounce Che?